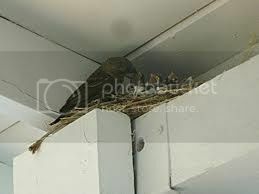 Eaves and open spaces like barns, beams, overhangs and other areas in or on structures are great for birds to a build nest. Certain species, like Barn Swallows, will come back to the same place year after year to nest; therefore, if they nested on your property in previous years, there is a good chance they will be back. It is best to deter birds before they arrive. Whether using preventative methods or treating a current bird problem, plastic bird netting is best for 100% exclusivity. Plastic bird netting keeps birds away from treated areas by creating a physical barrier between the structure and the birds. Plastic bird netting is a lightweight mesh net used to keep birds from nesting in unwanted areas. It is a very low cost solution to humanely get rid of birds. Plastic bird netting is made of U.V. protected polypropylene. It comes in a variety of mesh sizes: ¾”, ½” and ¼”. It is also available in several cut sizes to fit different size treatment areas. Ultra net is a lightweight plastic mesh that is meant for temporary use. To install netting to keep birds out of eaves or open spaces, the ultra-net clips can be used. Otherwise a staple gun can be used to secure the netting around the perimeter. When the birds realize they cannot access the area, they will move on to another location. Once the birds are gone you can remove the netting.